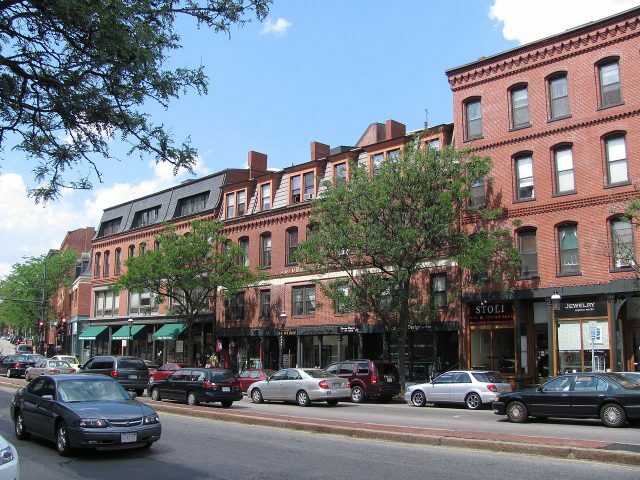 Brookline Village captures the quaint small-town feel in the mix of busy city streets. Traditional shops and small restaurants line either side of the street creating a charismatic neighborhood. Brookline Village is full of activity with constant cars and diverse people walking the street, from business people, visitors to Brookline Town Hall, or locals enjoying the neighborhood. Location: Brookline Village is located at the split of Washington Street and Harvard Street. Washington Street runs off of Boylston Street (Rt. 9) to bring you to the center of Brookline Village. Harvard Street runs from Commonwealth Avenue through Coolidge Corner to Brookline Village. Description: Brookline Village is rich with history. In the early 1800s, many German and Irish immigrants settled in Brookline Village. In the 1840s, the Linden area, just outside the center of Brookline Village, was created as one of the first developments in Brookline. The area was known as a “garden-suburb,” meaning that the area was for residential homes only, not allowing any other uses, such as manufacturing. Brookline Village contains many historical houses, including the William Bowditch House, located on Toxteth Street off of Linden Place, which served as a house for The Underground Railroad. Today, Brookline Village maintains its history and keeps the feel of a small town in a big city. A pleasant hubbub of people continually walks throughout Brookline Village. The streets are clean and comfortable with small, cozy shops, neighborhood restaurants, and many offices. A tall black clock stands in the center of the split between Harvard Street and Washington Street and in front of the large “Brookline Village” sign on the side of a building. The clock reads “Francis J. Hickey Triangle,” commemorating Francis J. Hickey, a soldier and community leader of Brookline who devoted his life to bettering Brookline Village and the town of Brookline. The architecture in Brookline Village matches much of the rest of Brookline, with red brick buildings lining the streets. Local retailers and restaurants reside in the bottom floor of these three and four-story buildings, while the upper-stories provide either offices or apartments. The buildings all have a polished and professional look coordinating with one another. Along the beginning of Harvard Street, most of the shops and restaurants have a similar structure, with wood trim and a green awning displaying the name of the shop or restaurant. Even places such as Dunkin Donuts have their building match this uniformed look for the street. The St. Mary’s of Assumption School, a Catholic school offering pre-k through eighth grade, is located on Harvard Street in the Brookline Village neighborhood. In addition, The Pierce School is also located in Brookline Village, serving as the public school in the neighborhood for pre-k through grade eight. Within a very short walk to the center of Brookline Village are the Brookline Town Hall and the Public Library of Brookline. The area for the two buildings has beautiful landscaping with green plants and trees creating a very appealing atmosphere around them. Also on Washington Street is the Brookline Public Safety Building, which was originally built as the fire station, and now houses the Brookline Fire Department and the Brookline Police Department. How to get there: Brookline Village is accessible from many forms of transportation. Brookline Village Station on the “D” branch of the Green Line is located on Station Street, off of Washington Street, and just outside the center of Brookline Village. Busses 65 and 66 both stop at the Harvard Street at Kent Street bus station in the center of Brookline Village. Further down Harvard Street, also near Brookline Village, is the Harvard Street at Pierce Street bus station, where Bus 66 also stops. Brookline Village is also driving accessible via Washington Street. Boylston Street, another major road in both Brookline and Boston, runs Southeast of Brookline Village and connects to Washington Street, providing easy access to Brookline Village. There are both street parking and parking lots available. Places to live: A variety of housing options are available in Brookline Village. Apartments are located above some of the shops and restaurants found on Washington Street. Off of Washington Street, on Davis Avenue, there are also several apartment buildings. In addition, many of the side roads, including Davis Avenue, White Place, and Thayer Street all have residential homes. Shopping and restaurants: An assortment of shops and restaurants are located in Brookline Village. The restaurants range from small cafes and sandwich shops. Brookline Village also offers an array of places to shop. There are local book stores, spas, boutiques, and toy stores. There are many services available such as cleaners, jewelers, florist, barbers, and hair salons. A variety of yoga and Pilate studios are also available in Brookline Village.